There is one very simple way of increasing the happiness of our lives. It consists in treating every individual we meet as though he were a personal friend. Our lives would be changed as though by magic if we really took a friendly interest in every person with whom we associated. Let's think of what this means. We act naturally when we meet a friend. We accept our friend as he is, and expect him to do the same with us. We are frank and honest and open with him. We are cordial when we deal with a friend. We greet him with a smile on our face, and our talk is in a pleasant tone of voice. We avoid harshness and shouting. We are careful not to get angry. 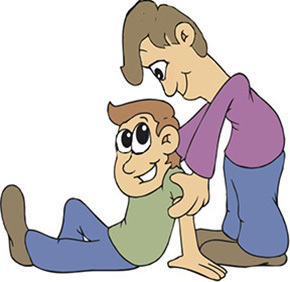 When a friend is in need, we have an instinctive desire to come to his aid. It may require extra effort or thoughtfulness or sacrifice. But we gladly exert ourselves for the sake of a friend. In fact, we anticipate his needs and offer our services even before he asks for them. If we manifest only a few of these signs of friendship in the ordinary dealings of our daily life, our relations with the people who surround us are bound to improve. To be natural, to be cordial, to be thoughtful and helpful and to be so constantly in our relationship with everybody, is a simple formula for the attainment of happiness. It is also a formula for success in life.